Ships separately in 1-4 weeks. (Ganoderma lucidum) Known as the Chinese Mushroom of Immortality because it’s an excellent immune modulator and helps your body adapt to environmental challenges. These powerful medicinal properties are best extracted from Reishi by grinding the fruiting bodies, then tincturing in alcohol and decocting in hot water. 100 plugs. 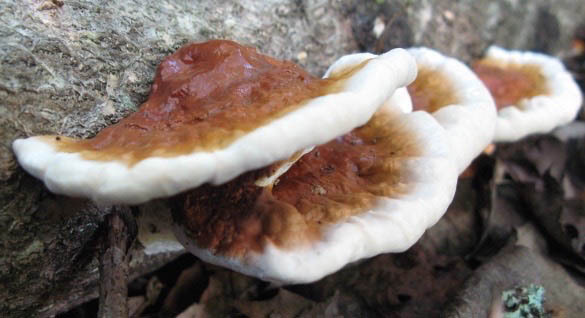 Reishi is naturally grown around the world. This woody medicinal mushroom grows well on partially buried logs of oak, maple, and other hardwoods. Please refer to our Mushroom Growing Guide for cultural information. Important shipping information: Mushroom spawn ships separately from any other items you order, directly from Sharondale Farm, where it is grown. 1-4 weeks after you place your order. U.S. Shipping Addresses only. We cannot apply priority shipping and handling to mushrooms.